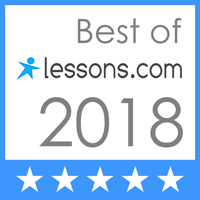 Have a question about lessons? Want to join our studio? Contact us using the form below and we will respond within 24 hours. You are only one click away from a lifetime of music! The Piano Sensei Studio offers custom piano lesson programs to students age 5 through retired adults. We love working with students of all abilities from very beginning to advanced, and we design your program based on your goals. Simply fill out the form below with your questions. My son has been taking piano lessons from Clinton for almost two years. He loves going to lessons and has improved beyond measure. Clinton keeps him focused while also making piano lessons fun. I highly recommend Clinton as an instructor! Jamie R.
I have been a piano student of Clinton’s since 2010. He’s a very unique teacher who is patient, encouraging, and presents strategies for practicing. He helped me realize that playing the piano is not just reading a group of notes on a page. There is much more to it than that. I now have an inner motivation to practice and play for others. Clinton has an excitement about music and that energy is contagious! Our son has been taking piano lessons with Clinton for 6 years and could not be happier! Clinton is an amazing instructor and very talented. His laid back approach has really resonated with our son. He’s great with all ages. His love for his profession shines through in all interactions. He has my highest recommendation! Clinton is an excellent teacher! He is patient and works well with any level. He covers all fundamental parts of music so that anyone can be a well-rounded musician. Get a studio tour, sample lesson, and plan your customized program!